The systems on which we rely for our financial transactions, food, fuel and livelihoods are so inter-dependent that they are better regarded as facets of a single global system. Maintaining and operating this global system requires a lot of energy and, because the fixed costs of operating it are high, it is only cost-effective if it is run at near full capacity. As a result, if its throughput falls because less energy is available, it does not contract in a gentle, controllable manner. Instead it is subject to catastrophic collapse. The eruption of the EyjafjallajÖkull volcano in Iceland led to the shut-down of three BMW production lines in Germany, the cancellation of surgery in Dublin, job losses in Kenya, air passengers stranded worldwide and dire warnings about the effects the dislocations would have on some already strained economies. During the fuel depot blockades in the UK in 2000, the supermarkets’ just-in-time supply-chains broke down as shelves emptied and inventories vanished. Anxiety about the consequences rose to such an extent that the Home Secretary, Jack Straw, accused the blockading truckers of “threatening the lives of others and trying to put the whole of our economy and society at risk”. Just as we never consider the ground beneath our feet until we trip, these glimpses into the complex webs of inter-dependencies upon which modern life relies only come when part of that web fails. When the failure is corrected, the drama fades and all returns to normal. However, it is that normal which is most extraordinary of all. Our daily lives are dependent upon the coherence of thousands of direct interactions, which are themselves dependent upon trillions more interactions between things, businesses, institutions and individuals across the world. Following just one track; each morning I have coffee near where I work. The woman who serves me need not know who picked the berries, who moulded the polymer for the coffee maker, how the municipal system delivered the water to the café, how the beans made their journey or who designed the mug. The captain of the ship that transported the beans would have had no knowledge of who provided the export credit insurance for the shipment, who made the steel for the hull, or the steps in the complex processes that allow him the use of satellite navigation. And the steel-maker need not have known who built the pumps for the iron-ore mine, or how the oxygen for the furnace was refined. Every café has customers like me who can only buy coffee because we are exchanging our labours across the world in ways that are dependent upon the globalised infrastructure of IT systems, transport and banking. The systems and the myriad businesses upon which they depend are only viable because there are economies of scale. Our global infrastructure requires millions of users across the world, the ship needs to carry more than coffee beans, and my café needs more than a single customer. The viability of my morning coffee requires the interactive economic and productive efforts of the globalised economy. Thinking this way enables us to see that the global economy, and thus our civilisation, is a single system. This system’s structure and dynamics are therefore central to understanding the implications of ecological constraints and, in particular for this analysis, peak oil. Here are some of its principal features. The usually seamless choreography of the global economy is self-organising. The complexity of understanding, designing and managing such a system is far beyond our abilities. Self-organisation can be a feature of all complex adaptive systems, as opposed to ‘just’ complex systems such as a watch. Birds do not ‘agree’ together that arrow shapes make good sense aerodynamically, and then work out who flies where. Each bird simply adapts to its local environment and path of least effort, with some innate sense of desire and hierarchy, and what emerges is a macro-structure without intentional design. Similarly, our global system emerges as a result of each person, company and institution, with their common and distinctive histories, playing their own part in their own niche, and interacting together through biological, cultural and structural channels. The self-organisation reminds us that governments do not control their own economies. Nor does civil society. The corporate or financial sectors do not control the economies within which they operate. That they can destroy the economy should not be taken as evidence that they can control it. We tend to see global economic growth in terms of change. We can observe it through increasing energy and resource flows, population, material wealth, complexity and, as a general proxy, GWP. This can be viewed from another angle. We could say that the globalising growth economy has experienced a remarkably stable phase for the last 150 years. For example, it did not grow linearly by any percentage rate for any time, decline exponentially, oscillate periodically, or swing chaotically. What we see is a tendency to compound growth of a few percent per annum, with fluctuations around a very narrow band. At this growth rate, the system could evolve, unsurprisingly, at a rate to which we could adapt. The sensitivity felt by governments and society in general to very small changes in GDP growth shows that our systems have adapted to a narrow range of variation. Moving outside that range can provoke major stresses. Of course small differences in aggregate exponential growth have major effects over time, but here we are concentrating upon the stability issue only. The growth process itself has many push-pull drivers: in human behaviour; in population growth; in the need to maintain existing infrastructure and wealth against entropic decay; in the need to employ those displaced by technology; in the response to new problems; and in the need to service debt that forms the basis of our economic system. As a species, we had to become problem solvers to meet our basic needs, deal with status anxiety and respond to the new challenges presented by a dynamic environment. The problem to be solved could be simple such as getting a bus or buying bread; or it could be complex, such as developing an economy’s energy infrastructure. We tend to exploit the easiest and least costly solutions first. We pick the lowest hanging fruit or the easiest extractable oil first. As problems are solved new ones tend to require more effort and complex solutions. A solution is framed within a network of constraints. One of the system constraints is set by the operational fabric, comprising the given conditions at any time and place which support system wide functionality. For modern developed economies this includes functioning markets, financing, monetary stability, operational supply-chains, transport, digital infrastructure, command and control, health services, research and development infrastructure, institutions of trust and socio-political stability. It is what we casually assume does and will exist, and which provides the structural foundation for any project we wish to develop. Our solutions are also limited by knowledge and culture, and by the available energetic, material, and economic resources available to us. The formation of solutions is also shaped by the interactions with the myriad other interacting agents such as people, businesses and institutions. These add to the dynamic complexity of the environment in which the solution is formed, and thus the growing complexity is likely to be reinforced as elements co-evolve together. As a result, the process of economic growth and complexity has been self-reinforcing. The growth in the size of the networks of exchange, the operational fabric and economic efficiencies all provided a basis for further growth. Growing complexity provided the foundation for developing even more complex integration. In aggregate, as the operational fabric evolves in complexity it provides the basis to build more complex solutions. As the globalising economy grows, increased population, wealth and integration opens up the possibility of greater economies of scale and more diverse productive niches. When new technologies and business models (solutions or sets of solutions) emerge, they co-adapt and co-evolve with what is already present. Their adoption and spread through wider networks depends on the efficiencies they provide in terms of lower costs and new market opportunities. One of the principal ways of gaining overall efficiency is by letting individual parts of the system share the costs of transactions by sharing common infrastructure platforms (information and transport networks, electric grid, water/sewage systems, financial systems), and integrating more. Thus there is a reinforcing trend of benefits for those who build the platform and the users of the platform, which grows as the number of users grows. In time, the scale of the system becomes a barrier to a diversity of alternative systems as the upfront cost and the embedded economies of scale become a greater barrier to new entrants, especially where there is a complex hub infrastructure. The lack of system diversity is not necessarily due to corporate monopolies. There is vigorous competition between mobile phone service providers but they share common information platforms and depend on electricity networks and the monetary system, both of which have little or no system diversity. Our operational systems are integrated into the wider economy. Expensive infrastructure and continual need for replacement components mean that economies of scale and a large number of economically connected people are necessary to make them viable. For example, the resources required to maintain the IT infrastructure on which we rely for critical services demand that we also buy games consoles, send superfluous text messages and watch YouTube. In other words, our non-discretionary needs and the critical systems that support them are affordable because they are being cross-subsidised by discretionary spending, which itself depends on further economies of scale being generated by the globalised economy that provides us with our discretionary income in the first place. From this perspective, asking about the resource requirements for individual products of the economy (a computer or my morning coffee, say) is akin to asking about the resource requirements for your finger; it only makes sense if the rest of the body is properly resourced. Finally, as new infrastructural platforms become established, legacy systems are left to shrink or decay. Thus, if suddenly we all were to lose the communications infrastructure introduced over the past ten years, we would not return to the system we had before that infrastructure was introduced. Instead, most of us would be left without any fall-back communication system at all. An isolated, poor and self-sufficient community is vulnerable to severe risk of a general failure of food production due to flooding or pestilence, say. Even comparatively rich France had 18 general famines in the eighteenth century and hundreds of local ones . Without access to money, weak transport links, markets and communications, surplus production from elsewhere could not relieve local starvation. The growth in the interconnectedness, infrastructure and institutions of the globalising economy meant local risks could be shared over wide networks, and this enhanced local resilience. One of the great virtues of the global economy is that while factories may fail and links in a supply-chain break, the economy can quickly adapt by fulfilling its needs elsewhere or finding substitutes. This is a measure of the resilience within the globalised economy and is a natural feature of a de-localised and networked complex adaptive system. But it is true only within a certain context. There are common platforms or ‘hub infrastructure’ that maintain the operation of the global economy and the operational fabric as a whole, and the collapse of such hubs is likely to induce systemic failure. Principal among these are the monetary and financial system, accessible energy flows, transport infrastructure, economies of scale and the integrated infrastructures of information technology and electricity. Lock-in can be defined broadly as an inability to deal with one problem by changing a sub-system in the economy without negatively modifying others upon which we depend. For example, our current just-in-time food system and agricultural practices are hugely risky. As the current economic crisis tightens, those involved in food production and distribution strive for further efficiencies and economies of scale as deflation drives their prices down. The lower prices help maintain welfare and social peace, and make it easier for consumers to service their debts, which in turn supports our battered banks, whose health must be preserved or the bond market might not show up at a government auction. As a result, it is very hard to do major surgery on our food systems if doing so required higher food prices, decreased productivity and gave a poor investment return. However, the primary lock-in process is the growth economy itself. We are attempting to solve systemic ecological problems within systems that are themselves dependent upon increasing resource depletion and waste. We are embedded within economic and social systems whose operation we require for our immediate welfare. But those systems are too optimized, interconnected and complex to comprehend, control and manage in any systemic way that would allow a controlled contraction while still maintaining our welfare. The problem of lock-in is part of the reason why there is no possibility of a managed degrowth. Peak oil is expected to be the first ecological constraint to impact significantly on the advanced infrastructure of the globalised economy. However, it is only one part of an increasingly integrated web of constraints including fresh-water shortages, bio-diversity loss, soil erosion and reduced soil fertility, shortages of key minerals and climate change. As a result, it makes little sense to compartmentalise our focus as we do through the UN Framework Convention on Climate Change, for example. The interwoven nature of our predicament is clearly shown by the Green Revolution of the 1960s that supposedly ‘solved’ the increasing pressure on food production from a growing population. Technology was marshalled to put food production onto a fossil-fuel platform, which allowed further population overshoot and thus a more general growth in resource and sink demands. The result is that even more people are more vulnerable as their increased welfare demands are dependent upon a less diverse and more fragile resource base. As limits tighten, we are responding to stress on one key resource (by, say, reducing greenhouse gas emissions or getting around fuel constraints by using biofuels) by placing stresses on other key resources that are themselves already under strain (food, water). That we have to do so demonstrates how little adaptive capacity we have left. Our basic and discretionary needs are dependent on a globalised fabric of exchange. So too is our ability to exchange our labour for the means to pay those needs. The conditions that maintain our welfare are smeared over the globe. We have adapted to the stability of globalising growth over the decades. Our skills and knowledge have become ever more refined so as to contribute to the diverse niches within the global economy. The tools we interact with — computers and software, mobile phones, machines and payment systems — maintain our productivity. So too do the supply-chains that feed us, provide inputs to our production process and maintain the operation of the systems we depend upon. Our productivity also depends upon the global economy of scale, not just those reaped by our direct customers, but also the conditions that support their economic activity in the wider economy. We are all of us intertwined. For this reason we can say that there is no longer any wholly indigenous production. If one side of the global economy is goods and services, the other side is money and credit. Money has no intrinsic value; it is a piece of paper or charged capacitors in an integrated circuit. It represents not wealth, but a claim on wealth (money is not the house or food we can buy with it). Across the globe we exchange something intrinsically valuable for something intrinsically useless. This only works if we all play the game, governments mandate legal tender and monetary stability and trust are maintained. The hyper-inflation in Weimar Germany and in Zimbabwe until it adopted the US dollar shows what happens when trust is lost. Like human beings and life on earth, economies require flows of energy through them to function and maintain their structure. If we do not maintain flows of energy (directly, or by maintenance and replacement) through systems we depend upon, they decay. Humans get their energy when they transform the concentrated energy stores in food into metabolising, thinking and physical labour, and into the dispersed energy of heat and excreta. Our globalising economy is no less energy constrained, but with one crucial difference. When humans reach maturity they stop growing and their energy intake stabilises. Our economy has adapted to continual growth, and that means rising energy flows. The self-organisation and biodiversity of life on earth is maintained by the flows of low-entropy solar energy that irradiate our planet as it is transformed into high-entropy heat radiating into space. Our complex civilisation was formed by the transformation of the living bio-sphere and the fossil reserves of ancient solar energy into useful work, and the entropy of waste heat energy, greenhouse gases and pollution that are the necessary consequences of the fact that no process is perfectly efficient. The first law of thermodynamics tells us that energy cannot be created or destroyed. But energy can be transformed. The second law of thermodynamics tells us how it is transformed. All processes are winding down from a more concentrated and organised state to a more disorganised one, or from low to higher entropy. We see this when our cup of hot coffee cools to the room’s ambient temperature, and when humans and their artefacts decay to dust. The second law defines the direction in which processes happen. In transforming energy from a low-entropy to a higher-entropy state, work can be done, but this process is never 100% efficient. Some heat will always be wasted and be unavailable for work. This work is what has built and maintains life on earth and our civilisation. The operational fabric evolves with new levels of complexity. As integration and co-dependency rise, and economies of scale become established, higher and higher fixed costs are required to maintain the operational fabric. That cost is in energy and resource flows. Furthermore, as the infrastructure, plant and machinery that are required to maintain economic production at each level expand, they are open to greater depreciation costs or, in thermodynamic terms, entropic decay. The correlation between energy use and economic and social change should therefore come as no surprise. The major transitions in the evolution of human civilisation, from hunter-gatherers through the agricultural and industrial revolutions, have been predicated on revolutions in the quality and quantity of energy sources used. We can see this through an example. According to the 1911 Census of England and Wales, the three largest occupational groups were domestic service, agriculture and coal mining. By 2008, the three largest groups were sales personnel, middle managers and teachers. What we can first notice is 100 years ago much of the work done in the economy was direct human labour. And much of that labour was associated directly with harnessing energy in the form of food or fossil fuels. Today, the largest groups have little to do with production, but are more focused upon the management of complexity directly, or indirectly through providing the knowledge base required by people living in a world of more specialised and diverse occupational roles. What evolved in the intervening century was that human effort in direct energy production was replaced by fossil fuels. The energy content of a barrel of oil is equivalent to 12 years of adult labour at 40 hours a week. Even at $100 a barrel, oil is remarkably cheap compared with human labour! As fossil-fuel use increased, human effort in agriculture and energy extraction fell, as did the real price of food and fuel. These price falls freed up discretionary income, making people richer. And the freed-up workers could provide the more sophisticated skills required to build the complex modern economy which itself rested upon fossil-fuel inputs, other resources and innovation. In energy terms a number of things happened. Firstly, we were accessing large, highly concentrated energy stores in growing quantities. Secondly, fossil fuels required little energy to extract and process; that is, the net energy remaining after the energy cost of obtaining the energy was very high. Thirdly, the fuels used were high quality, especially oil, which was concentrated and easy to transport at room temperature; or the fuels could be converted to provide very versatile electricity. Finally, our dependencies co-evolved with fossil-fuel growth, so our road networks, supply-chains, settlement patterns and consumer behaviour, for example, became adaptive to particular energy vectors and the assumption of their future availability. The growth and complexity of our civilisation, of which the growing GWP is a primary economic indicator, is by necessity a thermodynamic system and thus subject to fundamental laws. It is sometimes suggested that energy intensity (energy/unit GDP) is stabilising, or declining a little in advanced economies, a sign to some that local decoupling can occur. This confuses what are local effects with the functioning of an increasingly integrated global economy. Advanced knowledge and service economies do not do as much of the energy-intensive raw materials production and manufacturing as before, but their economies are dependent upon the use of energy-intensive products manufactured elsewhere, and the prosperity of the manufacturers to whom they sell their services. The phenomenon of peaking — be it in oil, natural gas, minerals or even fishing — is an expression of the following dynamics. With a finite resource such as oil, we find in general that which is easiest to exploit is used first. As demand for oil increases, and knowledge and technology associated with exploration and exploitation progress, production can be ramped up. New and cheap oil encourages new oil-based products, markets and revenues, which in turn provide revenue for investments in production. For a while this is a self-reinforcing process but eventually the reinforcement is weakened because the energy, material and financial costs of finding and exploiting new production start to rise. These costs rise because, as time goes on, new fields become more costly to discover and exploit as they are found in smaller deposits, in deeper water and in more technically demanding geological conditions. In some cases, such as tar sands, the oil requires very advanced processing and high energy and water expenditures to be rendered useful. This process is another example of declining marginal returns. The production from an individual well will peak and decline. Production from an entire oilfield, a country and the whole world will rise and fall. Two-thirds of oil-producing countries have already passed their individual peaks. For example, the United States peaked in 1970 and the United Kingdom in 1999. The decline has continued in both cases. It should be noted that both countries are home to the worlds’ best universities, most dynamic financial markets, most technologically able exploration and production companies, and stable, pro-business political environments. Nevertheless, in neither case has decline been halted. As large old fields producing cheap oil decline, more and more effort must be made to maintain production with the discovery and production from smaller and more expensive fields. In financial terms, adding each new barrel of production (the marginal barrel) becomes more expensive. Sadad al-Huseini said in 2007 that the technical floor (the basic cost of producing oil) was about $70 per barrel on the margin, and that this would rise by $12 per annum (assuming demand was maintained by economic growth). This rapid escalation in the marginal cost of producing oil is recent. In early 2002, the marginal cost of a barrel was $20. It is sometimes argued that there is a huge amount of oil in deposits such as the Canadian tar sands. The questions this claim raises are “When will it be on-stream?”, “At what rate can oil be made available?”, “What is the net energy return?” and “Can society afford the cost of extraction?” If less available net energy from oil were to make us very much poorer, we could afford to pay even less. Eventually, production would no longer be viable as economies could no longer afford the marginal cost of a barrel. In a similar vein, our seas contain huge reserves of gold but it is so dispersed that the energetic and financial cost of refining it would far outweigh any benefits (Irish territorial waters contain about 30 tons). The now familiar image of a modelled global oil production curve showing a decline in production of 2-3% per annum (EGross), has led commentators to assume that this is what will be available in future to the global economy. Intuitively this might seem an almost manageable constraint. The assumption on which this curve is based, the decline curve assumption, is incorrect for three reasons. Firstly, it does not account for the increasing energy cost of extracting oil; the net energy (ENet) available to society will decline at a faster rate than the modelled decline. Secondly, oil exporters, for the moment at least, are growing consumers of oil, and will favour domestic consumption over exports. This will reduce the volume of internationally traded oil. Figure 1: In this projection of a possible future, the steadily-increasing amount of energy required for economic growth to continue is shown by the line EGrowth. While the gross amount of energy that might be available is indicated by the line EGross and the net amount of energy after the energy required to deliver that energy has been deducted is marked ENet. In theory, the gap between the energy available and the energy required for growth (EGap) grows smoothly and steadily as the graph shows but this ignores powerful feedbacks caused by the gap itself. As a result, the gap is likely to grow far more rapidly and erratically. A decline in oil production undermines economic production, thus reducing society’s ability to pay for oil. A decline also, as we shall see, undermines the operational fabric, which in turn constrains the ability of society to produce, trade, and use oil (and other energy carriers) in a reinforcing feedback loop. Energy flows through the economy are likely to be unpredictable, erratic and prone to sudden and severe collapse. The implication is that much of the oil (and other energy carriers) that are assumed to be available to the global economy will remain in the ground as the real purchasing power, productive demand, energy infrastructure and economic and financial systems will not be available to extract and use it. Another misconception is that the output from other energy sources — natural gas, coal, nuclear, and renewable energy — are largely independent of oil even though oil is part of the systemic fabric of the global economy. At the most direct level, oil is used to transport coal and re-supply the infrastructure of natural gas and coal. More broadly, while oil is predominantly a transport fuel, the demand for it is tied to production in the wider economy, which is dependent upon natural gas and coal. A forced reduction in oil use would reduce economic production, which would induce a system-wide reduction in electricity and heating demand. At a wider level, all energy sources interact to maintain the global economy. If there was a major failure in that economy, the continued production, processing, trade and distribution of all energy sources may be imperiled. There would only be energy source independence if there was perfect real-time substitutability and a real-time net energy surplus in one or more of the alternative sources. If the peak in global oil production is imminent, or occurs within the next decade, we have neither the time nor the resources to substitute for oil, or to invest in conservation and efficiency. This point has been made recently by the UK Energy Research Council  and many others , . We can outline the general reasons as follows. It is not merely that we are replacing high-quality energy sources with lower-quality ones, such as tar sands and renewables. It is not that the costs of such alternatives are generally greater than established historical sources. Nor is it that the productive base for deploying alternative energy infrastructure is small, with limited ramp-up rates, or that it competes with food. Nor even that as the global credit crisis continues with further risks ahead, ramping-up financing will remain difficult while many countries struggle with ballooning deficits and pressing immediate concerns. The main point is that once the effects of peak oil become apparent, we will lose much of what we have called the operational fabric of our civilisation. For example, any degradation and collapse of the operational fabric in the near future may mean that we already have in place a significant fraction of the renewable energy infrastructure that will ever be in place globally. The thermodynamic foundations of the global economy are expressed through energy prices. Although the price of oil depends upon many things, supply and demand are the most basic. Speculation can be a major factor in setting prices too, but it may only have short-term effects and, if the world was awash with oil, there would be little incentive to speculate. On the supply side, the price paid for oil must be greater than the marginal cost of a barrel of oil, otherwise it’s not worth producing. On the demand side, the price that users can afford to pay depends on the health of their economy, which can be undermined by high oil prices. The oscillating decline model is an attempt to describe the effect of peak oil on an economy. In this model, constrained or declining oil production leads to an escalation in oil and food prices relative to available income, which feeds through to the whole economy. But economies cannot pay this price for a number of reasons. Firstly the price rises leave people with less money to spend on discretionary items, causing job losses and business closures amongst suppliers. Secondly, for a country that is a net importer of energy, the money sent abroad to pay for energy is lost to the economy unless it stimulates the export of goods of equivalent value (highly unlikely in this analysis). The constricted growth leads to rising defaults on loans and to less international trade that would support the servicing of external debt. It would raise interest rates as the future economic outlook became more precarious. There would be a tendency to save against the increased risks of unemployment. The general effect would be deflationary as money supply dropped in relation to available goods and services. This would add to what are already huge deflationary pressures arising from the deleveraging of the hyper-credit expansion of the last two decades. The rising cost of debt servicing, on top of food and energy price rises, would further squeeze consumption. The oscillating decline model assumes such stresses are not great enough to cause a terminal systemic global banking failure or a major monetary collapse. The decline in economic activity leads to a fall in purchasing power and a decline in all forms of energy demand and a fall in its price. Falling or volatile energy prices mean new production is less likely to be brought on stream. New energy investments in oil, renewable energy, natural gas or nuclear power, for example, become less competitive not just because energy prices are lower but also because existing energy infrastructure and supply has an overhang of spare capacity. Energy companies’ reduced revenue and the bad credit conditions further constrain their ability to invest in new production. The reduced revenue also means that the fixed costs of maintaining existing energy infrastructure (gas pipelines, the electric grid, refineries etc.) is a greater burden as a percentage of declining revenue. If production falls significantly, companies lose the economies of scale they have been getting from their infrastructure. For example, once the revenue from natural gas sales becomes less than the fixed operating costs of production platforms and pipelines, then continuing to deliver gas becomes no longer viable. That means that loss of economies of scale can lead to an abrupt supply collapse and the withdrawal of supply, leading to a further reduction in production capability, and thus in economic production. This is yet another positive feedback loop. These same conditions also constrain energy adaptation. For example, customers would find it more difficult to buy electric cars or invest in insulation, and governments to subsidise them. It would also be more difficult for the car manufacturers to ramp-up production and gain economies of scale (in addition to dealing with tight lithium supplies). In general, the tighter the economic and social constraints on an economy, the more likely it is that resources will be deployed to deal with current concerns rather than being invested in something that brings a future benefit. This expresses the generally observed increase in the social discount rate in times of growing stress. In such an energy-constrained environment, one would also expect a rise in geo-political risks. Bilateral arrangements between countries to secure oil and food would reduce the amount on the open market. It would also increase the inherent vulnerability to highly asymmetric price/supply shocks from state/non-state military action, extreme weather, or other “black swan” events. When oil prices rise above the marginal cost of production and delivery, but can still be afforded despite the economy’s decreased purchasing power, the energy for growth becomes available again. Of course local and national differences (in, for example, the degree of dependence on energy imports or the export of key production such as food) affect how regions fared in the recession and their general ability to pick up again. Even so, growth begins again, focusing maybe on more ‘sustainable’ production and consumption. However, the return of growth will not raise the purchasing power of the economy to its previous level because oil production will be limited by resource depletion; the lack of investment in production; the entropic decay of infrastructure and productive capacity; and the lower purchasing power which will reduce the price that the economy can afford to pay for its oil. The recovery will be cut short as rising oil, food and energy prices produce another recession. The sequence of events in the oscillating decline model is therefore as follows: economic activity increases — energy prices rise — a recession occurs — energy prices fall — economic activity picks up again but to a lower bound set by declining oil production. As a result, the economy oscillates to a lower and lower level of activity. The oscillating decline model does not account properly for some of the embedded structures of the global economy which, while relatively obvious, have been obscured by the fact that they were adaptive in a growing economy. If oil production declines, and we cannot fill the gap between the energy required for growth and what can be produced, as we saw in the oscillating decline model, this limits the availability of other types of energy, then the global economy must continue to contract. In short, humanity is at, or has exceeded, the limits to growth. Embedded structures that fail to contract in an orderly manner will break down. The structures that will break down include monetary and financial system, critical infrastructure, global economies of scale, and food production. As argued earlier, these structures are deeply inter-dependent. As a result, they will reinforce each other’s collapse. Their collapse undermines the whole operational fabric and the functioning of the global economy and all it supports. Recent research has indicated that as systems approach a tipping point they begin to share common behavioural features, irrespective of the particular type of system. This unity between the dynamics of disparate systems gives us a formalism through which to describe the dynamic state of globalised civilisation, via its proxy measure of Gross World Product (GWP) and its major state variable, energy flow. Catastrophic bifurcation is the name given to a type of transition where once the tipping point has been passed, a series of positive feedbacks drives the system to a contrasting state. For example, as the climate warms, it increases methane emissions from the Arctic tundra, which drives further climate change, which leads to a further growth in emissions. This could trigger other tipping points such as a forest die-off in the Amazon Basin, itself driving further emissions. These positive feedbacks could mean that whatever humanity does would no longer matter as its impact would be swamped by the acceleration of much larger-scale processes. Figure 2: The state of a system responds to a change in conditions. The continuous line represents a stable equilibrium. In A a change in conditions drives an approximately linear response in the systems state, unlike B where a threshold is crossed and the relationship becomes very sensitive. The fold bifurcation (C, D) has three equilibria for the same condition, but the one represented by the dotted line is unstable. That means that there is a range of system states that are dynamically unstable to any condition. Source . Figure 2 shows how the system state responds to a change in conditions. The state of a system could represent the size of a fish population, or the level of biodiversity in a forest, while the conditions could represent nutrient loading or temperature (both effectively energy vectors). The continuous line represents a stable equilibrium; the dotted line an unstable one. In a stable equilibrium, the state of the system can be maintained once the condition is maintained. In figure a) and b) we see two different responses of a stable system under changing conditions. In the first, a given change in conditions has a proportional effect on the system state; in the latter, the state is highly sensitive to a change in conditions. In c) and d) the system is said to be close to a catastrophic bifurcation. In both of these cases there is an unstable region, where there is a range of system states that cannot be maintained. If a system state is in an unstable regime, it is dynamically driven to another available stable state. If one is close to a tipping point at a catastrophic bifurcation the slightest change in the condition can cause a collapse to a new state as in c), or a small perturbation can drive the system over the boundary as in d). The state of our civilisation necessarily depends on the state of the global economy. I mentioned earlier that the global economy has been in a dynamic but stable state for 150 years or so, because it has had compound economic growth of about 3% per annum within a narrow band of fluctuation during that time. The state of the global economy is indicated by annual GWP growth of approximately 3%, and GWP is absolutely dependent upon rising energy flows. To argue that civilisation is on the cusp of a collapse, it is necessary to show that positive feedbacks exist which, once a tipping point has been passed, will drive the system rapidly towards another contrasting state. It is also necessary to demonstrate that the state of the global economy is driven through an unstable regime, where the strength of the feedback processes is greater than any stabilizing process. It acknowledges that there may be an early period of oscillating decline, but that once major structural components (international finance, techno-sphere) drop or ‘freeze’ out, irreversible collapse must occur. In the new post-collapse equilibrium state we would expect a collapse in material wealth and productivity, enforced localisation/de-globalisation, and collapse in the complexity as compared with before — an expression of the reduced energy flows. As I write, fears are being expressed that a Greek sovereign default may be inevitable and that, as a result, the markets might refuse to lend to Ireland, Portugal and Spain, causing them to default as well. In Ireland, as in other countries, deflation is continuing as the money supply contracts, and people retrench their spending because of fears of future unemployment. As our debt burden becomes greater in relation to our national income, it adds to the instability in the eurozone. A contagious default would be a major blow to German and French banks, which have lent to all four countries. The economic historian Niall Ferguson argued that US fiscal deficits could lead at some point in time to a rapid collapse in the United States economy, noting “most imperial falls are associated with fiscal crisis”. Such a crisis would drag down every other economy, including those of China and Saudi Arabia. These examples point to three things. One is that while money may not have any intrinsic value, it can nevertheless decide the fate of nations and empires. The second is that in an integrated globalised economy, a crisis in one region can become everybody’s crisis. Finally, it emphasises that the risks arising from huge indebtedness (and implied trade imbalances) are still with us, irrespective of resource constraints. The latter signifies the necessary irony that never before have we been so indebted, which is essentially an expression of our faith in future economic growth, just as that growth becomes impossible due to resource constraints. Earlier I explained that the monetary and financial system was a hub infrastructure of the global economy, with no operational alternative. It is based upon credit, interest and fiat currencies. Credit underpins our monetary system, investment financing, government deficit financing, trade deficits, letters of credit, the bond market and corporate and personal debt. Credit, and the promise of future economic growth, supports our stock market, production, employment and much else besides. It is a primary institutional infrastructure of the global economy. Over the whole of an economy, in order for debt to be repaid with interest, the money supply must increase year on year to replace the money lost to the economy when interest payments are made. Money is injected into the economy when additional loans are taken out. Accordingly, the payment of interest requires an increasing level of debt, and eventually, the level of debt will become unsupportable unless incomes grow as well, either because the economy has grown or because there has been an inflation. If loan repayments including interest exceed the value of the new loans being taken out, the money supply contracts. If it does so, less business can be done, so firms fail and there is less purchasing power in the economy and increasing difficulties with servicing debts. This causes people to spend less, and investment borrowing to fall. In other words, a deflationary spiral develops. On the other hand, if debt, and thus the money supply, increases without a corresponding increase in GDP, money’s purchasing power is reduced by inflation. Increasing GDP requires increasing energy and material flows. With an energy contraction, the economy must contract. In a growing economy, debts can be paid off as they fall due, because borrowers are prepared to take out enough additional loans to cover the payment of the principal plus interest on old loans as they mature. In a permanently contracting economy, the shrinking income makes the payment of even the interest increasingly difficult as, with inadequate borrowing, the money supply declines. Another way of putting this is that reducing energy flows cannot maintain the economic production required to service debt. The value of the debt needs to be written down to a level appropriate to the new level of production. This write-down can be achieved by either mass defaults or by inflation. Consequently, if the economy is expected to shrink year after year, the number of people prepared to borrow or lend money in the conventional way will dry up, as no-one will be confident that the borrowers will have enough income to make the interest payments. A bank’s main assets are the loans on its books. If even a tenth of those loans cannot be repaid, that bank is wiped out because making good the losses would take more than its shareholders’ capital and retained profits. Its depositors could not be repaid in full and its government or central bank would have to step in to make good the loss and allow the bank to continue to trade. If the bank’s losses continued as incomes and asset values fell further, the government is likely to reach the end of its borrowing capacity. It would be open to the central bank to create money out of nothing to fill the hole in the bank’s books, but it is likely to be reluctant to do so for fear that the new money would cause inflation. Unlike previous monetary crisis, one caused by declining incomes and asset values would be systemic and global. There would be no ‘outside’ lender to provide rescue, or external hard currency to provide reserves for important imports. Nor could the system be ‘re-set’ in the expectation of future growth, because those expectations would have little foundation. As the deflationary pressures would continue as the crisis developed, the prices of oil, food, and debt servicing would rise in relation to people’s falling incomes. There would be an increasing frequency of sovereign defaults, banking collapses and runs, declining production, panic buying and shattered public finances. In such a context, printing money (not necessarily by conventional quantitative easing) and currency re-issues are likely to become necessary. Unless the money issue was tightly controlled, this could open the door to hyper-inflation. However, forecasting and control of money supply may be very difficult due to the intrinsic uncertainty of the monetary and economic environment. An additional inflation risk is that, if people began to have doubts over their bank deposits and future monetary stability, they may start spending on necessities and resilient assets, driving up the velocity of money and further increasing inflation. Trust is the central principle underpinning the global monetary system and thus the trade networks upon which we rely. Governments can in theory print endless money, at almost no cost, to their hearts’ content. That we trade it for our limited assets, or our finite labours, is a measure of the remarkable trust bequeathed to us through our experience of globalising growth. The economist Paul Seabright argues that trust between unrelated humans outside our own tribal networks cannot be taken for granted. Because trade is, in general, to all our benefit, we have developed institutions of trust and deterrence (‘good standing’, legal systems, the IMF, banking regulations, insurance against fraud, and the World Trade Organization, etc.) to reinforce co-operation and deter freeloaders. Trust builds compliance, which confers benefits, which in turn builds trust. But the reverse is also true. A breakdown in trust can cause defections from compliance, further reducing trust. Because our governance and monetary policy is national (the Euro is likely to fail), but our basic needs are supplied globally, countries will be tempted to engage in predatory devaluations followed by inflations. This could occur even if governments were directly issuing debt-free money to citizens. Governments act firstly for their own citizens. In an evolving crisis, they are also likely to favour clear immediate benefits over uncertain future ones. Facing pressing immediate and projected national needs, the prospect of a continuing decline in the global productive base, and the risks of collapse in the operational fabric, governments are likely to face the following choice: maintain the value of your currency by limited issuance in the hope that it will in future be more acceptable to foreign traders, or ‘stealth’ print money to make a grab for international assets and inputs before there is a major system failure. Furthermore, if currency crises are seen as inevitable, and hard asset barter or currency backing are likely to supersede it, then the break-up of countries’ dedication to monetary stability becomes a matter of when, not if. In such a manner, the globalising trust dynamics that evolved in the confidence in future growth begin to break down. Remember, we only exchange something of intrinsic value for currency if we can assume that the money we get can be exchanged later on for something else of intrinsic value. In other words, we need to be able to assume that exchange rates will be stable and that inflation will be low in the period before we spend the money again. The instability of debt money, fiat currencies and competitive devaluations all remove the basis for this assumption. Money becomes very difficult to value in space (for foreign exchange and trade) and in time (for savings and investment). We can say that it becomes opaque. Bank intermediation, credit and confidence in money holding its value are the foundations of the complex trade networks upon which we rely. The mismatch between our dependencies upon integrated global supply-chains, local and regional monetary systems, and nationalised economic policy, which has not been a problem up to now, will become so as the monetary crisis develops. A complete collapse in world trade is an extreme but not unlikely consequence. Even if debts are written off or inflated away, a much higher proportion of everyone’s reduced incomes will be absorbed by food and energy purchases. However, a country will only be able to import energy, food and inputs for its production processes by exporting something of equal value, because it will not be granted credit to run a trade deficit. The uncertainty about the value of money, and fears of future degradation of the operational fabric, is likely to mean that commodities such as gold, oil, grain and wood may be used as currency to settle accounts. However, this form of payment is ill suited to the complexity of global inputs. Exports will collapse along with the level of production within a country, making it even more difficult to import energy or materials to increase production. As I explained earlier, modern economies produce almost nothing indigenously, as supply-chain breakdowns causing key production inputs to become unavailable become increasing likely. This will cause further production problems and make it likely that countries will remain trapped at a very low level of economic activity. Moreover, because our supply-chains are so complex and globalised, local failures in monetary stability, lack of inputs, or a failing operational fabric would propagate through supply-chain links and other national operational fabrics. In this way, localised failures quickly become globalised. Global food producers are already straining to meet rising demand against the stresses of soil degradation, water shortages, over-fishing and the burgeoning effects of climate change. It is estimated that between seven and ten calories of fossil-fuel energy go into every one calorie of food energy we consume. It has been estimated that without nitrogen fertiliser, produced from natural gas, no more than 48% of today’s population could be fed at the inadequate 1900 level. No country is self-sufficient in food production today. The fragility of the global food production system will be exposed by a decline in oil and other energy production. It is not just the more direct energy inputs, such as diesel, that would be affected, but fertilisers, pesticides, seeds, and spares for machinery and transport. The failing operational fabric may mean there is no electricity for refrigeration, for example. It should be clear even from the above overview that a major financial collapse would not just cut actual food production, but could result in food left rotting in the fields, an inability to link surplus production with those in need, a lack of purchasing power and an inability to enact monetised food transactions. Our critical reliance upon complex just-in-time supply-chain networks means there is little buffering to protect us from supply shocks. In the event of a shock, unless precautions are taken, it is likely that hunger could spread rapidly. Even in a country that could be food independent or a net exporter, it may take years to put new systems in place. In the interim, the risks are severe. We mentioned that more and more of people’s declining income will go on the most non-discretionary purchases, in particular food and energy. What does this mean for developed economies where most energy and a fair amount of food is imported, and which together employ only a few percent of a population? It means not only mass unemployment, but also a tiny amount of purchasing power chasing the declining availability of the necessities we depend upon. A similar position would exist in other countries. Imports and exports would drop rapidly. The unemployed, schooled and adapted to specialised and largely service roles in the globalised economy, would be quite at a loss for a considerable period. In addition we would face reverse economies of scale. As the size, integration and complexity of the global economy has grown, our local well-being has become more and more dependent upon global economies of scale. Economies of scale work at every level-not just in the good you buy, but in all the components that went into making it, and so on. Similarly, all the hub infrastructures depend on globalised economies of scale. The lower unit prices have led to greater sales volumes and have also a freed up discretionary income to be spent on other goods and services. Thus our purchasing power too is dependent upon economies of scale. The evolution of our economies and economic infrastructure has been predicated upon increasing economies of scale. If the scaling-up process goes into reverse, reduced purchasing power, and the constriction in non-discretionary consumption, causes purchases to fall and unemployment to rise. Fewer goods and services are sold, which reduces economies of scale, which causes prices to rise, causing further falls in sales. The problem is particularly acute for very complex products and services with limited substitutability, and ones that have high operational costs. For example, as fewer users can afford to replace mobile phones or computers, or use them less, the cost of the personal hardware and maintaining the network rises per user. Rising costs mean less discretionary use and so on. This is a serious matter for the operators because common IT platforms require a large number of users to keep costs per user low. In effect, the most discretionary use (say, Facebook, texting and Playstation) keeps down the cost for more important uses such as business operations, banking, the electricity grid and the emergency services. Remove the discretionary uses and the cost for businesses and critical services begins to escalate. Furthermore, large hub infrastructure has a fixed cost of operation and maintenance. Once income falls below the operating cost, the system will be switched off unless supported from outside. As government income is likely to fall greatly, this may not be possible. We are deeply dependent on the grid, IT and communications, transport, water and sewage, and banking infrastructure. In general, these are amongst the most technologically complex and expensive products in our civilisation. Their scale and capacity is determined by current and the projected growth in economies, meaning they have high fixed costs. They are viable because there is purchasing power, economies of scale, open supply-chains and general monetary stability over the world. They both comprise and are dependent upon the operational fabric. Because of their complexity and scale (implying high levels of entropic decay), this infrastructure requires continuous inputs for maintenance and repair. These inputs are often very complex, have limited lifetimes and require specialised components that depend upon very diverse and extensive supply-chains. For the various reasons discussed, substitutes and sub-components for missing inputs may not exist, causing critical infrastructure to break down. Or, the infrastructure provider or component suppliers may not be able to afford inputs due to loss of purchasing power in economies, loss of economies of scale or monetary collapse. The tight coupling between different infrastructures magnifies the risk of a cascading failure in our critical infrastructure and thus a complete systemic failure in the operational fabric upon which our welfare depends. At the very least, a failing infrastructure feeds back into reduced economic activity and energy use, further undermining the ability to keep the infrastructure maintained. Our knowledge and response to expectations of the future shape that future. One area that is most sensitive to this is financial markets. Money only has value because it can be exchanged for a real asset such as food, clothing or a train journey. As long as we share the confidence in monetary stability, we can save, trade and invest. It is a virtual asset, as it represents only a claim on something physically useful. For most of us, bonds and equities are effectively virtual, as very few shareholders have any meaningful access to underlying physical assets; they are mediated by money. However, the current valuation of virtual assets towers over real productive assets on which their value is supposed to be based. A bond is valuable because we expect to be paid back with interest some years hence; paying 20 times earnings for shares in a company is a measure of confidence in the future growth of that company. Conversely, if a productive asset cannot be made to produce because of energy and resource constraints and the failing operational fabric, it loses its value. This implies that virtual wealth, including pension funds, insurance collateral and debt, will become worth much less than at present, or effectively evaporate. The widespread acknowledgement by market participants (and governments) that peak oil is upon us, coupled with an understanding of its consequences, is likely to crash the global financial system. Initially, just a few market participants will begin to question their faith in the overall stability and continued growth of the system and thus the likely value of their virtual assets. However, the transition can be very rapid from a few market participants accepting the idea that the system could break down permanently, to large-scale acceptance. A fear-driven, positive feedback conversion of a mountain of paper virtual assets into a mole-hill of resilient real assets could develop. This would help precipitate an irretrievable collapse of the financial and economic system. The opportunity to re-boot the globalised economy from a trough in the oscillating decline model, or from a collapsed state, so as to return it to the operation and functionality of its current state, is likely to be deeply problematic. We can consider this from four standpoints. As Germany was hit by the global economic crisis, there was a big drop in the need for commercial transport. As a result trains and locomotives were taken out of use. A year later as the economy picked up, the trains were again required. But in the interim, cylinders and engines had rusted. The trains were of no use until repairs could be carried out, which required finance, time and open supply-chains. There was a costly shortage for a while but a fully functioning operational fabric and wider economy ensured there was no disaster . If we have a major economic collapse, the longer it continues the greater the entropic decay of our productive and critical infrastructure, and the more difficult it will be to re-boot. The global economy we have now is the result of a self-organising process that emerged over generations. If it collapsed, we would lose the infrastructure that allowed that complex self-organisation to emerge. Post-collapse, we would have to begin with top-down conscious re-building; this would suffice for simple projects but not the hyper-complex products with globalised sourcing we rely upon today. In this paper, I have focused on some well-defined collapse mechanisms that are to varying degrees necessary, though they are by no means exclusive. Social stresses, health crises, and the effects of climate change may all add to our difficulties. By way of illustration we can consider climate change. We are likely to see a major (forced) drop in emissions of anthropogenic greenhouse gases. However, temperature may continue to rises for many decades. Furthermore, we are left with uncertainty as to whether we have crossed tipping points in the climate system that could accelerate terrestrial emissions. Few studies of the economic impact assume we will be very much poorer in future. The physical effects of climate change, in the form of flooding or reduced food productivity, will amplify the effects of the collapse processes. Being much poorer, and without our current operational fabric, will mean that the relative cost of adaption and recovery from climate induced shocks will escalate beyond our ability to pay much sooner than if our economies continued on their present courses. Furthermore, we will lose the buttressing provided by insurance, and the open supply-chains and strong globalised economies that could re-distribute surplus food from elsewhere. In the increasing stress of the moment, available resources are more likely to be invested in dealing with immediate needs over long-term investment. The stability of the globalising economy has provided the context in which planning and investment could occur. The inherent uncertainty in the collapse process will also tend to favour shorter-term actions. This will reduce the resources for re-booting the system to its former state. An amalgam of the oscillating decline and the collapse model has been offered as a guide rather than a prediction. The irony is that people may rarely notice they are living under energy constraints. Energy retraction from the global economy can be achieved by production declines or collapses in demand, though as we have seen, they are deeply inter-related. We may experience energy use collapse not as an energy constraint, but as a systemic banking collapse and vanished purchasing power. While energy is generally regarded as non-discretionary, energy use can drop considerably and welfare can, to some degree, be maintained. Food will represent a far more persistent challenge with the strongest real price support. For collapses in food supply and/or demand may well be associated with famine. smaller territories integrated within a single political unit. The integration and speed of processes (financial information, capital movement, supply-chains, component lifetimes, etc.) within the globalised economy suggest that a collapse will be much faster than those that have gone before. Furthermore, the level of delocalisation and complexity upon which we depend, and our lack of localised fall-back systems and knowledge, suggests that the impacts may be very severe for the most advanced economies. No country or aspect of human welfare will escape significant impact. Our understanding and expectations of the world have been shaped by our experience of economic growth. The dynamic stability of that growth has habituated us to what is ‘normal’. That normal must soon shatter. Our species’ belle époque is passing and its future seems more uncertain than ever before. Here we are referring to the 95% drop in the Baltic Dry Shipping Index. See http://www.globaleconomicanalysis.blogspot.com/2008/10/baltic-dry-shipping-collapses.html. Korowicz, D. (2010) Tipping Point: Near-term Systemic Implications of a Peak in Global Oil Production. www.feasta.org/Riskresilience/tipping_point. Maddison, A. (2007) Contours of the World Economy 1-2030AD. Page 81 Oxford Univ. Press. See Beinhocker, E. (2005) The Origin of Wealth: Evolution, Complexity, and the Radical Remaking of Economics. Rh Business Books. Jones, B. (2009) The Burden of knowledge and the Death of the Renaissance Man: Is Innovation Getting Harder? Review of Economic Studies 76(1). Tainter, J. (1988) The Collapse of Complex Societies. Cambridge University Press. State of the Nation: Defending Critical Infrastructure. Institute of Civil Engineers (2009). Braudel, F. (1981). The Structure of Everyday Life (Vol. 1): The limits of the possible. Collins. Page 74. Chaisson, E. (2001) Cosmic Evolution: The Rise of Complexity in Nature. Harvard Univ. Press. Kinsella, T. Politics must liberate itself for revolution to succeed. The Irish Times. 16th March 2009. Cleveland, C. et al. Energy and the US Economy: A biophysical Perspective. Science 255 (1984). Ayres, R., Ayres, L., Warr, B. Energy, Power, and Work in the US Economy, 1990-1998. Energy 28 (2003). Ayres, R., Warr, B. (2009) The Economic Growth Engine: How Energy and Work Drive Material Prosperity. Cambridge, Edward Elgar Publishing. Cleveland, C., Kaufmann, R., Stern D., eds, Aggregation and the Role of Energy in the Economy. Ecological Economics 32. Elsevier (2000). World Energy Outlook (2008). The International Energy Agency estimates a ‘natural’ decline rate of 6.7%, which would be expected to rise as production became more dependent upon smaller fields. Sorrell, S. and Speirs, J. (2009) Global Oil Depletion: An Assessment of the Evidence for the Near-Term Physical Constraints on Global Oil Supply. UKERC Report. Heinberg, R. (2009) Searching For a Miracle: Net Energy Limits and the Fate of Industrial Society. Forum on Globalisation and The Post Carbon Institute. Trainer, T. (2007) Renewable Energy Cannot Sustain a Consumer Society. Springer. The evolving credit crisis has led to a drop of 19% in energy investments in 2008 according to the International Energy Agency and the cancellation of many projects that depended upon high oil prices such as the tar sands. Hamilton, J. (2009) Causes and Consequences of the Oil Shock 2007-2008. Brookings Papers on Economic Activity. March. 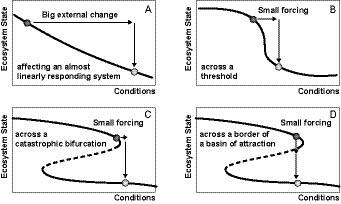 Scheffer, M. (2009) Critical Transitions in Nature and Society. Princeton Univ. Press. Scheffer, M et al. (2009) Early-warning signals for critical transitions. Nature Vol. 461 3 Sept.
Ferguson, N. (2010) Complexity and Collapse: Empires on the Edge of Chaos. Foreign Affairs March/ April. Seabright, P. (2005) The Company of Strangers: A Natural History of Economic Life. Princeton Univ. Press. Soddy, F. (1926) Wealth, Virtual Wealth and Debt: the Solution of the Economic Paradox. George Allen and Unwin. Godfray, H et al. (2010) Food Security: The Challenge of Feeding 9 Billion People. Science Vol. 327. Smil, V. (1999) Long-Range Perspectives on Inorganic Fertilisers in Global Agriculture. International Fertiliser Development Centre. This entry was posted in Cascading Failure. Bookmark the permalink.